Aboriginal claims remain a controversial but little understood issue in contemporary Canada. 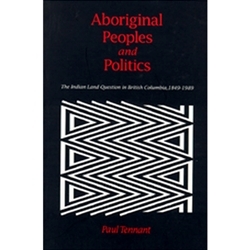 British Columbia has been, and remains, the setting for the most intense and persistent demands by Native people, and also for the strongest and most consistent opposition to Native claims by governments and the non-aboriginal public. Land has been the essential question; the Indians have claimed continuing ownership while the province has steadfastly denied the possibility.